Brazilian Jiu-Jitsu (BJJ) is a martial art that focuses on grappling and ground fighting as a self defense. Jiu-Jitsu has recently become more popular and is noted to be one of the fastest growing MMA sports in the United States. The concept of BJJ is that smaller people who are not as strong can defend themselves against a larger more stronger opponent. Through the use of skillful leveraging techniques and effective groundwork, Brazilian Jiu Jitsu martial artists are able to manipulate, subdue, and control their opponent. Are you looking for a positive recreational activity for your child? Would you like your child to develop better focus, improved self-discipline, and increased confidence? Would you also like to make your child “bully-proof”? Then, you came to the right place! Here at Blind Fury BJJ, your child will learn real self-defense skills from day one, while they also learn valuable life skills to help them succeed in school and life. Along with their jiu-jitsu training, your child will learn character values such as respect, courage, and self-control in our daily mat chats. So what is Brazilian Jiu-Jitsu? Brazilian Jiu-Jitsu (BJJ) is a martial art, sport, and self-defense method from Brazil that evolved from Japanese jiu-jitsu and judo at the turn of the 20th century. Unlike modern sport judo or traditional jiu-jitsu which emphasize stand up locks and throws, Brazilian Jiu-Jitsu focuses on the ground game – how to defeat an opponent when the fight goes to the ground. Blind Fury of Columbus will positively change you and your child. Are you ready to take the next step towards a more healthier, confident, dedicated life? 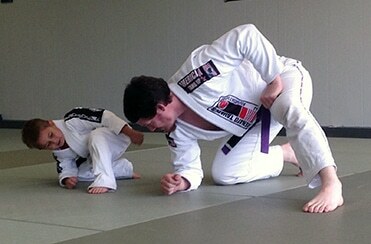 Brazilian Jiu-Jitsu will help you overcome fear, anger and self-doubt, and leave you feeling confident in any situation. We offer discipline and focus in ways that you may not yet, believe you could achieve. Stop by! You will believe!